Do you smile a lot less these days due to missing teeth? 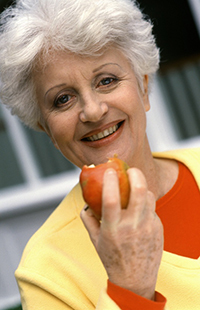 Dentures can fill the gaps in your smile and make eating much easier. Our Roseville, CA, dentists, Dr. Ibtisam Rashid and Dr. Hana Rashid, discuss the benefits of dentures and share information on denture types. Improved Self-Esteem: It may be hard to feel good about yourself if you're unhappy about the changes in your smile. Dentures not only restore your missing teeth but may also help you feel proud of your smile again. No Food Restrictions: Tooth loss can force you to make drastic changes to your diet. Without teeth, it's impossible to break foods into small pieces. A diet of soft foods and liquids is one solution, but in addition to being boring, your new diet may not provide the nutrition you need. Dentures restore your ability to eat a full and varied diet. Better Appearance: Your teeth don't only help you bite and chew, but also support your facial muscles. When they're gone, the muscles may begin to sag, aging you prematurely. Clearer Speech: Missing teeth make it difficult to pronounce some words. After you receive dentures, you'll find that your speech is much clearer. When you visit our Roseville office, we'll help you select dentures based on the degree of your tooth loss and your preferences. If you've lost all your teeth, full or immediate removable dentures are a good choice. Both types of dentures replace all of the teeth in your upper or lower jaw. You'll receive full dentures once your mouth heals, but can begin wearing immediate dentures as soon as your teeth are extracted. Because your mouth will change in the months after your extractions, your immediate dentures will need to be relined or rebased periodically. Partial dentures may be recommended if you're only missing a few teeth, while overdentures might be the perfect option if remnants of some teeth remain in your mouth. Implant-supported dentures are the newest type of dentures available. The dentures are attached to dental implants that bond to your jawbone or a metal framework attached to the implants. Implant-supported dentures can be more comfortable than full or immediate dentures and don't affect your biting power. Would you like to find out which type of dentures are best for your situation? Call our Roseville, CA, dentists, Drs. Hana and Ibtisam Rashid, at (916) 780-1955 to schedule an appointment.